The data junkie in you will love the Ironman Run Trainer S and D with Heart Rate Monitor. Talk about the ultimate training gadget, this Ironman watch has it all from GPS to heart rate monitor. Just imagine, you can customize the display to feed you four sets of data, keep an eye on your target heart rate and download the data as well as plot your route on your computer. 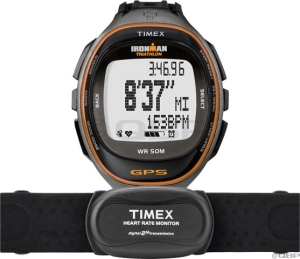 Whether you're training for the Leadville 100 or simply looking to catalog all of your training data and routes, Timex has the solution. Best of all, the Ironman Run Trainer S and D is reasonably sized when compared with similar products on the market.